Due to the exclusive nature of some of our accommodation choices which do not allow us to hold space without deposit, we require a $1000 per person deposit at time of reservation. Optional Single Supplement: $688 USD (number of singles limited). We're very excited to once again offer a more active tour in Italy. Years ago we did a hiking tour in Tuscany and Liguria with great success, but the area eventually became too popular -- farmers and private property owners began banning access to ancient walking routes, sites became annoyingly crowded, and prices rose out of reach. But after two of our senior head office staff travelled to Piemonte -- one on a research work trip and the other on a family vacation -- our attention turned to this oft-overlooked, but up-and-coming region with all of the charm, history, culture, and yummy food as more famous places, but without the crowds and lofty costs. There is no Colosseum, Leaning Tower, Michelangelo, or Spanish Steps here, but that's exactly the attraction! This trip showcases all that makes this gorgeous corner of Italy so special. Guided walks through vineyards were excellent. Rice farm trip was excellent. Cooking class was great as was the food we produced. The local guides were excellent. Enjoyable holiday - good group of people to spend time with. Good tour leader. A lot of new experiences. I liked the hiking in the vineyards with Guiseppe; the truffle hunting, the wine tastings, and really liked the cooking class and the people involved with it. The local guides were outstanding. Knowledgeable, friendly, engaging, listening, watching how it was going: all the things you would want! Obviously, a lot of work had gone into choosing the hotels to provide a good variety of experiences. The meals were excellent. The food was of high quality, and delicious. Our tour leader was a pleasure to be with. She cared about each of us, and as a group. I was delighted with this tour, the tour leader, the local guides, and the accommodation. I enjoyed any walk in the country such as vineyards and mountain road at Sant. di S. Magno. Even the Sanctuary of Crea was a nice little walk. The rice farm visit was really interesting. The truffle hunting was great. All the local guides were excellent. The ability to stay in one place for multiple nights made the overall trip more enjoyable. All accommodations were clean and well maintained. Excellent, thank you. A great new adventure that we are sure will be popular. Today the group arrives at Torino (Turin) Airport (TRN). Italy's second-largest region is arguably its most elegant: a purveyor of Slow Food and fine wine, regal palazzi, and an atmosphere that is superficially more Français than Italiano. But dig deeper and you'll discover that Piemonte (aka Piedmont) has 'Made in Italy' stamped all over it. Emerging from the chaos of the Austrian wars, the unification movement first exploded here in the 1850s, when the noble House of Savoy provided the nascent nation with its first prime minister and its dynastic royal family. 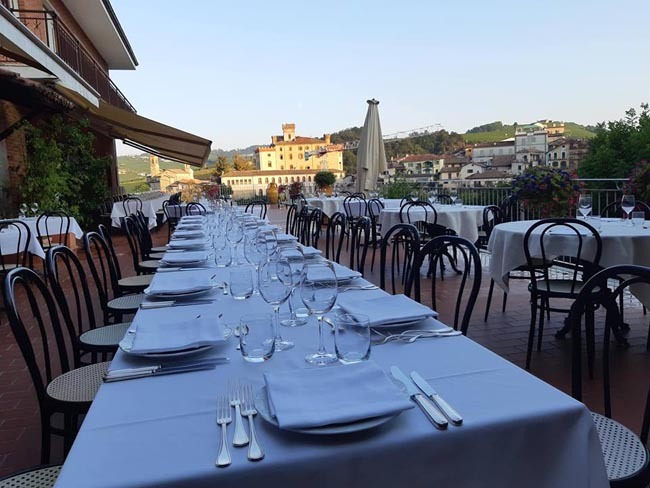 Today, most conflicts are disagreements over favourite wines and who has the best recipes, in a charming laid back region not unlike nearby Tuscany in look and atmosphere, but without the crowds and high prices! This morning we enjoy a tour of Torino with a local guide. The industrial grey and polluted "car city", as Torino was known until the end of the 1990s, has nowadays given way to an elegant, vibrant, and cosmopolitan metropolis that will pleasantly surprise even the most well-travelled visitor. 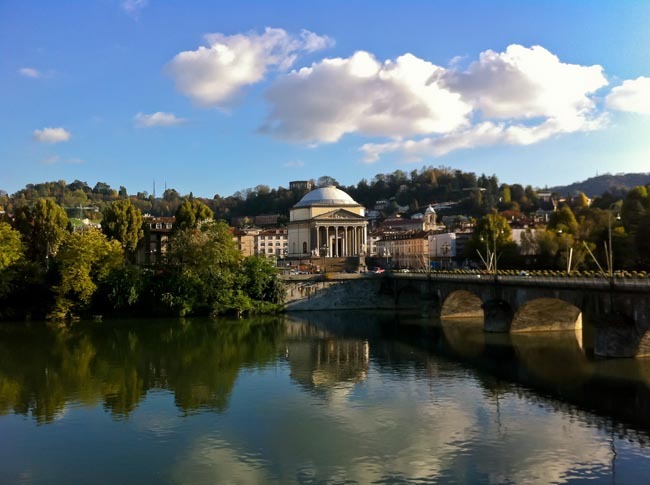 With two thousand years of history, Torino developed from a Roman military settlement to the capital of the kingdom of the House of Savoy, and in 1861 became the first capital of the newly-unified Italian nation. As a result, the urban grid spread with large tree-lined boulevard, baroque facades, and art-nouveau covered shopping galleries can remind of some corner of Paris even though a unique local character is predominant. In more recent times, Torino hosted the 2006 Winter Olympic Games, an event that changed the face of the city. Among many attractions, we mention the Holy Shroud – an important (and controversial) relic for Christianity – which is displayed periodically and the second largest Egyptian museum in the world. Today Torino is a technology and design centre, as well as a university campus with students from all over the country. Our walking tour gravitates around the central Piazza Castello with a look at the magnificent Church of Saint Lawrence, a masterpiece of baroque architecture. 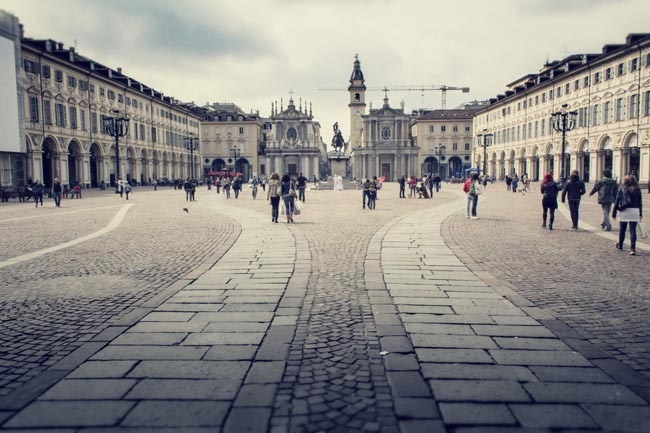 From the Royal theatre, down to Piazza Carignano and to the XVIII century Piazza San Carlo, our guide reveals hidden private courtyards and leads discussion on the social changes that Torino has faced throughout history. After a break for lunch and some free time, we'll transfer to our Agriturismo surrounded by vineyards in the Asti Region near Torino (+/- 90 minute drive). For four nights we are based at a 4-star 'agriturismo' south of Asti proper. Typically, an agriturismo is an independently-owned farm that the owners have decided to use partially — although usually only partially — for accommodation purposes. That means that, 90 percent of the time, you can expect that the owners of your "hotel" are, primarily, farmers (or people who have someone else farm for them). 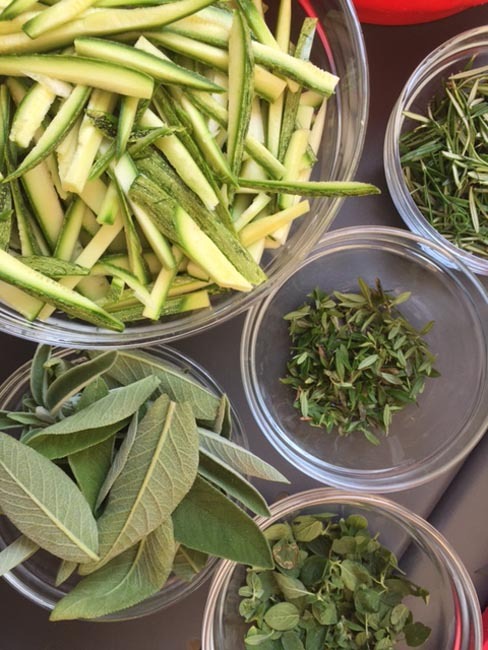 It's a relaxing and intimate way to experience rural Italy and, since many of Italy’s best food traditions aren’t found in swanky restaurants, but in nonna's house in the countryside, there's often no better dining than at an agriturismo. Overnight and dinner near Asti. This morning we depart the hotel for some leisurely hiking* through the vineyards with a local guide. Our route takes us over the hills where the very last reaches of the Monferrato District meet the Langhe Hills, and where Barbera grapes give way to Moscato and crops of hazelnuts (9-10km/6-7 mi, medium effort, about 100m of elevation gap with at least three hills to be climbed. Well-maintained/trodden path). Here the hills are covered in vineyards, with medieval hill towns and ancient castles perched atop their peaks. The scenery is gorgeous, but what really attracts visitors is the outstanding wine and food—Barolo reds, white truffles, handmade pasta, and many more delicacies. 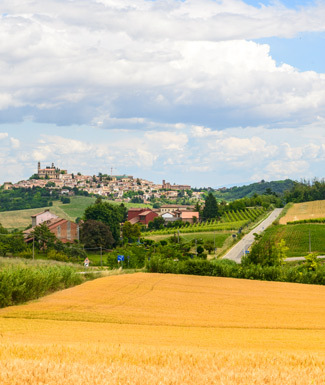 Along with Monferrato and Roero, the Langhe was made a UNESCO World Heritage Site in 2014 for its cultural landscapes and wine making traditions that go back hundreds of years. Our day includes a visit to a cellar for a tour and tasting. We will try four wines paired with salami and cheese. We then hike back to our hotel (2 hours) and enjoy some free time before dinner. Our 4-course dinner this evening will be at a neighbouring agriturismo (15 min drive). The glorious past of this town comes back to life as we walk the medieval streets of the historic centre. Proclaimed an independent city-state in 1095 due to its strategic commercial position, Asti became powerful to the point of minting its own coins, accepted and exchanged all over Europe. Our guided walking tour begins in the main square. We visit the food market to learn about some traditional products of the area and continue through the Jewish ghetto, spotting towers and baroque churches. The imposing cathedral is the largest Gothic building in Piemonte, boasting a collection of paintings by local artist, Gandolfino da Roreto, the first in town to complete works of art influenced by the Renaissance. Lunch on your own in town -- local specialities to try include hazelnuts, chocolate (this is where Nutella and Ferrero Rocher come from! ), tajarin (long thin egg pasta), gnocchi al Castelmagno (potato dumplings with a pungent local cheese), and agnolotti (a type of ravioli). Our local guide leaves us before we continue to Canelli (30 minutes), where we visit the underground cellars of one of the historic producers of sparkling wines. We are introduced to the stories of a few local families, whose production of sparkling wine set off at the end of the XIX century by following the traditional champagne technique. We gain access to the perfectly-preserved underground cellars, dug in the compact limestone, whose fascinating architecture and their historical value, resulted in being part of the 50th UNESCO World Heritage site of Italy. Here we enjoy a tasting of Italian spumante. Today we have a guided tour of Acqui Terme with a local guide. Acquae Statiellae, founded in the second century AD by the Romans, enjoyed an economic and social bloom in its day, many vestiges of which are still visible in the ruins of the thermal spas and aqueduct. The elegant city center blends the modern section with the medieval area called "Pisterna", where the Cathedral dedicated to the Assumption and the Castle of the Paleolithic Dynasty are located. Piazza della Bollente is home to the eclectic temple where visitors can drink the sulphur water naturally emerging from the bowels of the earth at a temperature of 75 degrees Celsius. smaller teams and everyone will have the chance to experience all recipes. Our dinner is paired with the organic wines produced at the farm by Maria Pia's husband. Drive back to the hotel for our last night at our Asti agriturismo. Today we check-out of our agriturismo and travel by road to the area of production of Italian rice (one hour). Here we visit a traditional rice farm set in the province of Vercelli with a local guide. Stories of the harsh life of yesterday's farmers and employees are combined with the tour of the modern production. Learn how rice is cultivated and processed to become either brown or white. We include a lunch including two starters and two different risottos served in a casual osteria. We then continue 40-minutes to the Sacred Mountain of Crea. The Sanctuary of Crea is one of the nine Sacred Mountains scattered between Piedmont and Lombardy, a mystical place of great inspiration, where art and nature blend. An uphill trail between the twenty-three chapels in which theatrical effects with human-sized statues and frescoes have been realized, with the task of amazing the pilgrim. The sanctuary contains two ancient chapels: Santa Margherita, frescoed on the commission of the Marchesi del Monferrato, and that of the Madonna. Here lies the wooden statue carved, according to tradition, by the evangelist Luca and transported to Piedmont by Eusebius, the first bishop of the region. We hope to walk a section of one of the most beautiful trails in the area; this walk runs along the highest hill of the territory and leads towards the Sacred Mount. We continue by road to the Barolo area. For a break from the group dynamic (and due to the hearty nature of our lunch today), dinner will be on your own in this charming town. 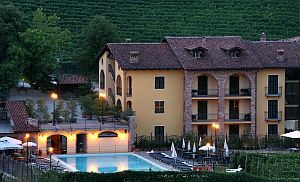 Overnight in Barolo OR nearby Cherasco. 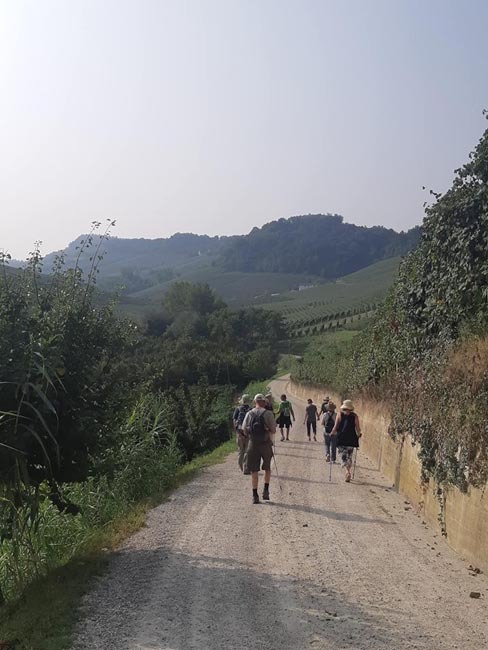 This morning we meet our local guide and begin our hike in the area of production of the Barolo wine, over the Langhe Hills. Our trek begins from the main square of the town of Barolo, where the precious wine was first produced. Our route takes us through vineyards and quiet countryside roads off-the-beaten-track, all the way to a different municipality for a total of about 10km/6 mi round-trip. 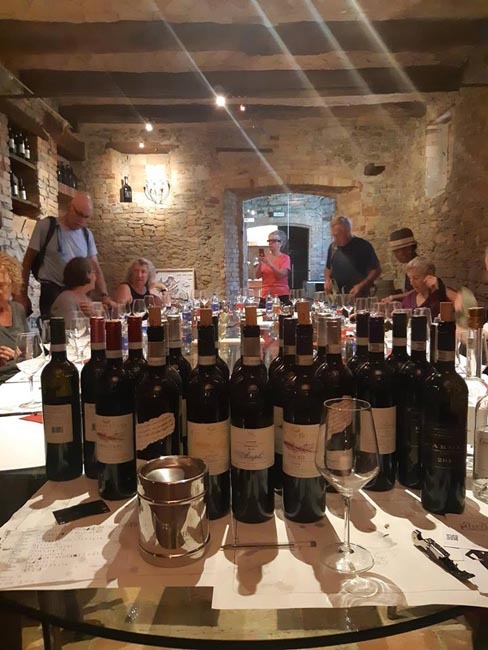 We visit a traditional family-run wine cellar and relax with a tasting of at least four wines (and light snacks only -- we can acquire lunch while in Barolo) before heading back to Barolo on a different route. Return to our hotel with leisure time before dinner at our hotel. Today we go on a truffle hunt with a local guide and local dog. Regardless of the type of truffles (black or white) available in the season when the hunt takes place, the aim of this activity is to show how truffles are found and taken out from the ground. 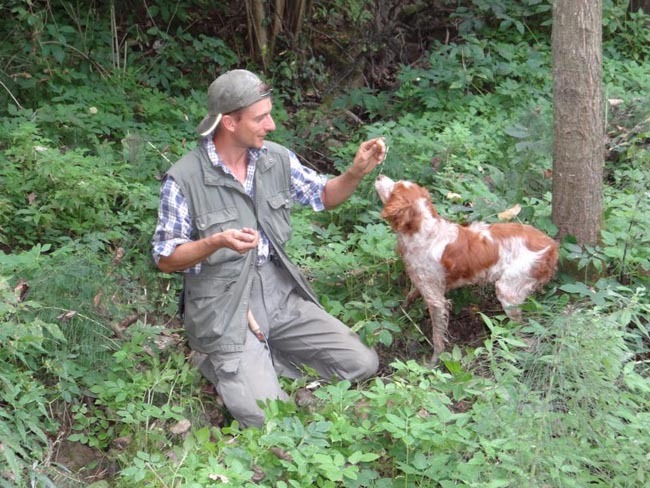 Truffle hunting can be considered a "guided tour" in the woods, where you get a complete presentation on the environment needed for truffles to grow, trees involved, soil characteristics and bits of the hunter's family-story. All aspects of truffles are explained, including the sensory and technical analysis -- essential to understand the quality of the product -- and how truffles are best-preserved and eaten. After a gourmet truffle tasting in Alba in a local shop -- truffle salami, cheese, truffle spread, truffle oil, honey etc -- enjoy a tour of Alba with a local guide. After a bit of free time in town, we'll transfer to La Morra and enjoy a downhill hike back into Barolo, via vineyard rows, farmsteads, villages, wineries, former convents, chapels, cabins, and a unique and fascinating landscape. Today we check-out of our Barolo hotel and transfer to Mondovi where we have a tour with a local guide. From the lower part of the modern city built along the Ellero stream, we'll climb via modern funicular to Mondovi Piazza, founded in 1198 by the populations of the villages of Vico, Vasco, and Carassone who rebelled against the bishop of Asti and took refuge in Monteregale. The central square on two levels is embellished with fresco-ed façades of houses, palaces, and churches, among which the “Mission” stands out as a high example of Jesuit architecture where Andrea Pozzo practiced his prospective art. After a break for lunch we'll have a guided tour of Santuario di Vicoforte, featuring the world's second largest elliptical cupola. The dome was built by architect Francesco Gallo on a structure designed about two centuries earlier by Vitozzi on commission of Carlo Emanuele I of Savoy. We continue by road (40 minutes) to the town of Cuneo for dinner and overnight. 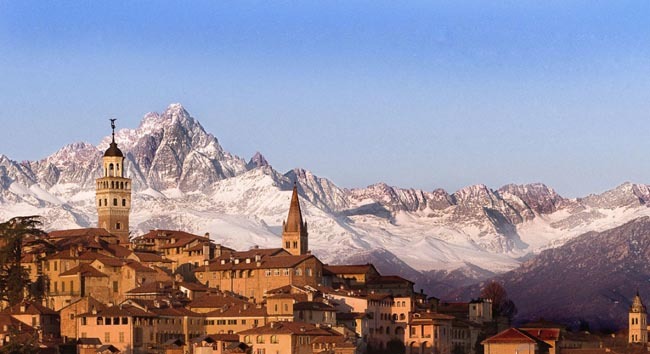 Sitting on a promontory of land between two rivers, Cuneo provides excellent alpine views framed by the high pyramid-shaped peak of Monte Viso in the Cottian Alps. There is a raft of reasons why one should visit stately Cuneo, not least being the food, the hiking possibilities nearby, and, last but certainly not least, the city's signature rum-filled chocolates. 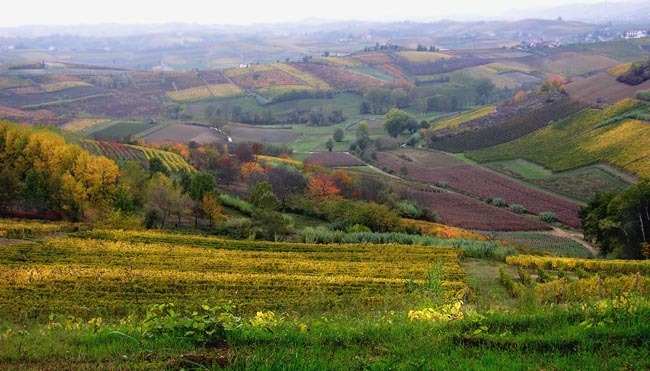 True to the meaning of its name ('foot of the mountain'), Piemonte is a land of mountains. It is surrounded on three sides by the Alps, with the highest peaks and largest glaciers in Italy. Today we drive to an alpine valley bordering France (1 hour) with a local guide, with a hike of about 8km/5 mi from the highest part of the Grana Valley down to the small village of Campomolino. We continue by road to a cheese farm where the famous local Castelmagno cheese is aged in natural grottoes. Castelmagno cheese has ancient origins. It is said it was first produced in the eleventh century, although the first documents referring to it date back to the thirteenth century. Since then, the local cheese factories have been producing it following the ancient traditions, despite a period of low production due to the World Wars. 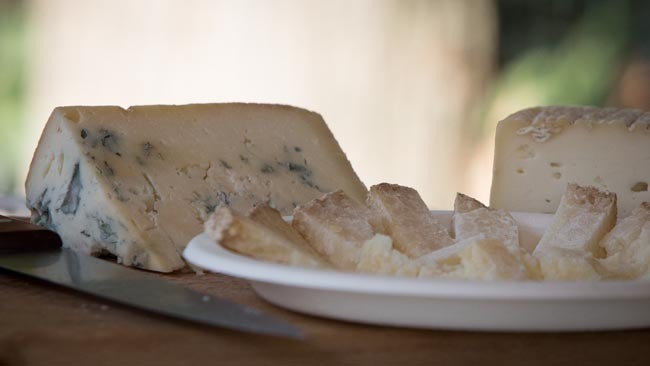 After learning the production process, enjoy a tasting of four types of cheese. We then drive to Saluzzo (1 hour) for a guided tour of the town. Visiting Saluzzo is a true journey back in time, with a medieval old town with a fairytale atmosphere. 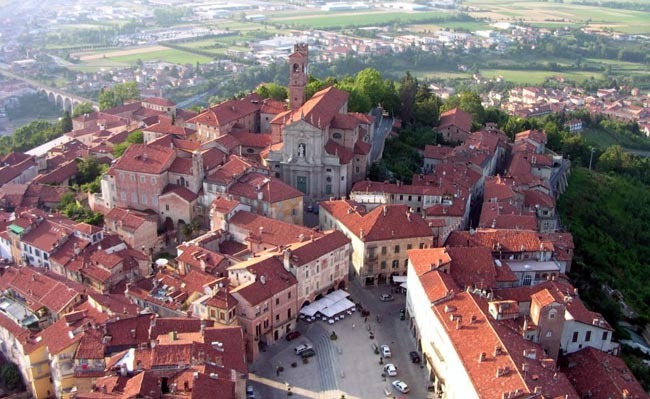 The seat of a powerful marquis who kept the region under pressure for about five centuries, Saluzzo maintained close ties with neighbouring France. We'll be certain not to miss the church of St. John, with its precious funeral monument, and the nearby Casa Cavassa with the works of the Flemish painter, Hans Clemer. Drive back to Cuneo (45 min). This morning we shift gears a bit with a visit to the Italian Riviera. Once we leave behind the Ligurian Alps, you'll be amazed by the quick change of atmosphere, surrounded by lavish Mediterranean vegetation, palm trees, and colourful small towns once fishing villages, built along the coast. We'll stop in the walled town of Finalborgo, where we can explore the quaint medieval hamlet built in the valley overlooking the sea, boasting monasteries and century-old architecture. 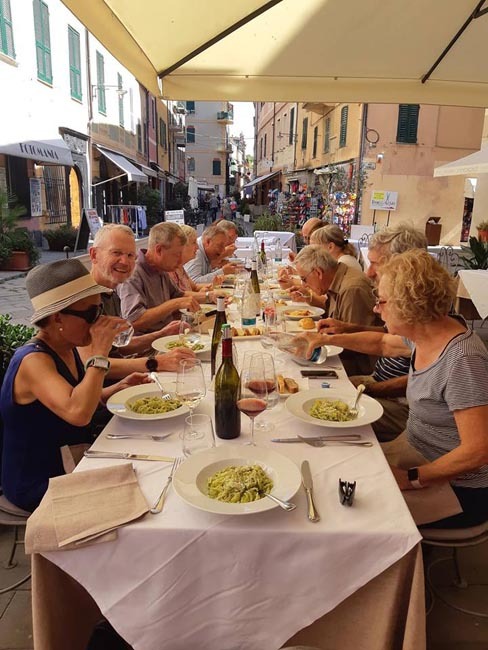 In Finale Ligure we enjoy a traditional lunch of pasta with pesto sauce and fresh catch of the day. We then walk along the beach to the next town of Varigotti (4.8km/3 mi, one way) where we visit a small family-run olive oil mill and sample some bruschetta and olive spread. Return to Cuneo with dinner on your own this evening. Today we travel by road to Torino with a stop at the Abbey of Saint Michael en route. An iconic monument of the Piemonte region, the Abbey of San Michele is undoubtedly one of the most striking architectural highlights of the province of Torino, and is shrouded in legend, mystery, and macabre details. Founded on the rocky spur of Mount Pirchiriano in the Val di Susa (Susa Valley) between 983 and 987, the Sacra is one of the sites dedicated to the Archangel Michael. Intriguingly, the Sacra di San Michele lies in perfect geographic alignment with three other Saint Michael monasteries, on a straight line from Skellig Michael (Ireland), over Saint Michael's Mount (Cornwall, England), to the Monastery of Saint Michael (Symi island, Greece), before coming to an end in Jerusalem at Mount Carmel. 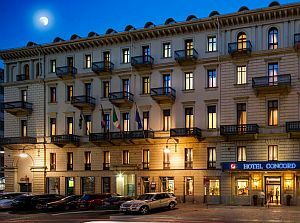 We continue to Torino and our centrally-located hotel with some time at leisure to enjoy Torino before our farewell dinner. 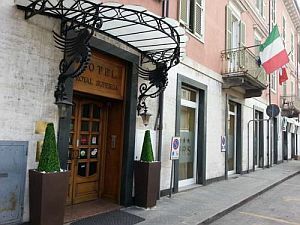 A 3-minute walk from Torino Porta Nuova train station, this conservative hotel lies 1.3 km from both Turin Cathedral and ...	Royal Palace of Turin. Plush rooms and suites with soundproof windows provide flat-screen TVs and minibars. Tenuta La Romana is perched on the hills of the Langhe and Monferrato in Piedmont . Originally, in the eighteenth ...	it was a farmstead for breeding thoroughbred. The name “La Romana” comes from L’Arman-na, given by the previous owners, the Calamandrana counts, in memory of Rome, which was so dear to them. Carefully restored with respect to the original architecture, the construction of two floors opens to the outside with huge arched windows from the floor to the ceiling on one side to a pergola and pool. 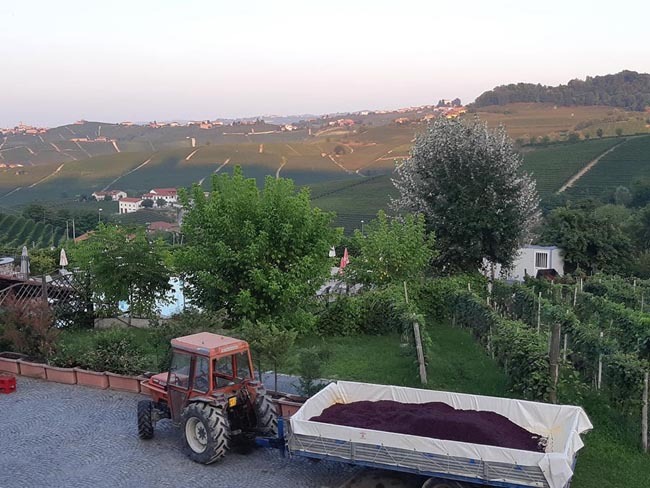 The Brezza private estate lies next to the small town of Barolo, immersed in the vineyards, as is the nearby ...	Barolo and Restaurant Brezza, also property of the Brezza family. The estate extends over twenty-two hectars, of which sixteen and a half are vineyards, some dating back to 1885. 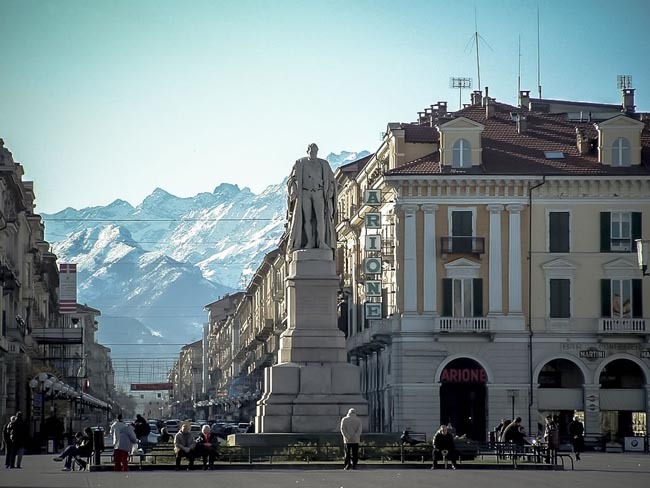 Set in a townhouse dating from 1887, this conservative hotel is a 2-minute walk from the Galimberti House Museum, a ...	walk from Cuneo train station. Cozy rooms with sleek decor provide flat-screen TVs and free Wi-Fi. Upgraded rooms add soundproof windows, and tea and coffee making facilities. Breakfast daily, most dinners, some lunches (as per tour itinrary). All sightseeing and entrance fees for sites noted as 'visited' in the detailed itinerary. Gratuities for local guides, drivers, restaurant staff, porters. Airport transfers for land & air customers and for early arriving/late departing land & air customers who book their extra hotel nights through us. Please note that transfers are provided from Torino Airport only (ie, not from Milan). International airfare to/from the tour. Most lunches, some dinners. Tour Leader gratuities, drinks, personal items (phone, laundry, etc), insurance, international air taxes (if applicable), and any excursions referenced as 'optional'. Airport transfers for Land Only customers. We've timed our September departure to coincide with harvest season, during which grapes are ripe and pretty on the vine, local fruit and vegetables feature prominently on local menus, and weather is warm and agreeable. Our May/June departure features green landscapes, lots of flowers, early season crops (berries, asparagus, greens) and mild temperatures. The climate here is relatively mild, though we'll have some warm-hot days, with cool mornings and overnights. Showers are possible at any time in this area, but both of our dates are outside of the main rainy period which generally runs November-March. Most transport is by private air-conditioned vehicle, +/- 24 seats depending on ultimate group size (see 'group size'). Due to the winding roads and lack of accessibility on narrow streets in small towns and villages, we will avoid the large motor-coaches more typical of large group touring. One of the delights of exploring this compact region is the lack of long road journeys, allowing us to maximize our time doing, seeing, smelling, tasting, experiencing, and soaking it all in. Our "level 3" difficulty rating refers to the walks/hikes that are sprinkled throughout our program. This activity does not occur every day, but as per our tour itinerary, even when not on a "hike," we will be on foot quite a lot, with town walking tours, winery visits, with plenty of places with uneven surfaces and stairs (we're in the hills!). This program also has a strong gastronomic element, well-suited to "foodies," expert or novice, and those who enjoy savouring and lingering over a meal and sampling new things. While vegetarians are well catered for, we regret that very specific or extremely limited dietary restrictions/preferences will present a considerable challenge on this trip. 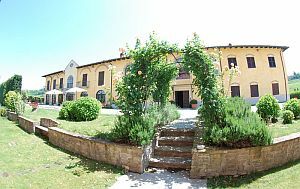 Three nights on this trip are accommodated at an 'agriturismo', an independently-owned farm that the owners have decided to use partially for accommodation purposes. That means that 90% of the time, you can expect that the owners of your "hotel" are, primarily, farmers (or people who have someone else farm for them). 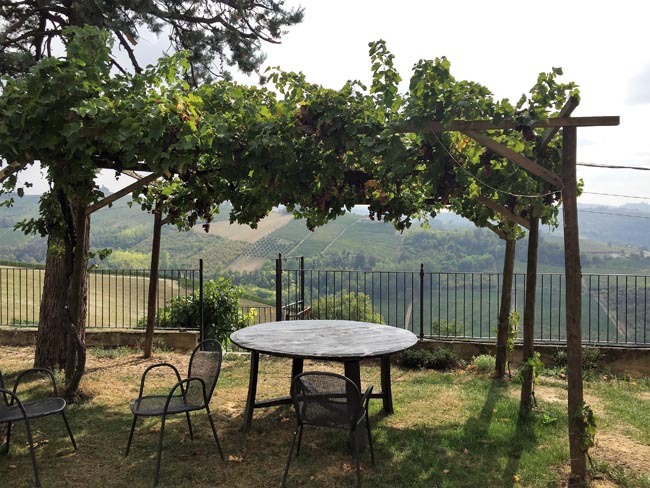 It's a relaxing, intimate, and highly-personalized way of experiencing rural Italy. Elsewhere, our hotels are well-located, modern 4-star properties. Porter service is available (see 'inclusions') though you should be independent with your luggage. As is the norm in Europe, single rooms are limited in number and likely smaller than twins. Tour Leader throughout & local guides for town/city touring and for our hikes on which local knowledge and insight are of value and appropriate.